Radial Engineering Ltd. is pleased to announce the StageBug SB-5 Sidewinder Laptop direct box, a DI designed for quick deployment on busy stages and for the fast-paced environment of the AV system tech. According to Radial President Peter Janis: "With so many productions now using computers, we felt that the time had come to bring out an additional solution to our range. 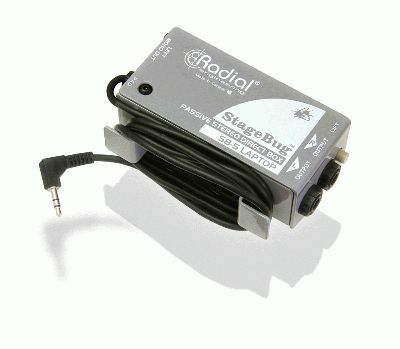 The StageBug SB-5 Sidewinder is unique in that it has an integral cable and storage cleat which makes it easy to deploy and impossible to lose the cable! There's nothing more painful than trying to find a 3.5mm interface cable when you are in the heat of the action. I also think the super compact design will be of particular benefit to the audio-video tech. These guys travel with their own service kits and having a ready solution in the work case will certainly be welcomed." The SB-5 features an integral 1.5 meter (5ft) cable terminated in a 3.5mm (1/8) connection for laptops, tablets and personal music players that is secured in place with a compression fitting. The cable is neatly wrapped and safely stored away using the sidewinder cable cleat. Connection from the source device is usually done using headphone output. Inside the SB-5, two transformers deliver full stereo operation. The transformers perform the balancing while assisting in reducing noise by isolating the input from the output to eliminate hum and buzz caused by ground loops. A ground lift switch at the output further advantages noise suppression. Should a device with an extra high output be encountered, the -15dB input pad is activated to reduce sensitivity and prevent overload distortion. Two ¼ TRS output connections provide a choice of balanced or unbalanced stereo connections to the PA system. An additional XLR output sums the left-right signals to mono, reducing channel count requirements where full stereo is not required. Housed in heavy steel and finished in baked enamel, the SB-5 feels solid and roadworthy. The full bottom no-slip pad provides mechanical isolation and electrical insulation when placing the SB-5 on other electrically charged devices. These features combine to make the SB-5 a great choice for the front-of-house engineer, AV system tech and musician who travel with a laptop.